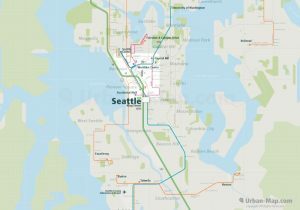 Seattle Rail Map - A Smart City Guide Map, Even Offline! 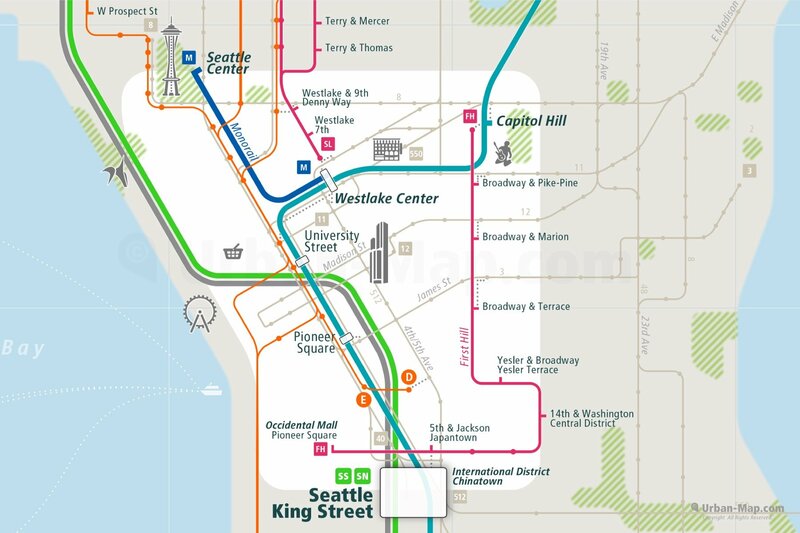 The Seattle Rail Map is a train route city map that includes Streetcar, Central Link, Monorail, Tacoma Link, South & North Line, Amtrak, RapidRide Bus Rapid Transit, King County Bus 3, 8, 11, 12, 40, 44, 45, 48 and Sound Transit Bus 512, 545, 550 and Airport Link in the public transport network of Seattle city area. Download the full Seattle Rail Map on App Store & Google Play. 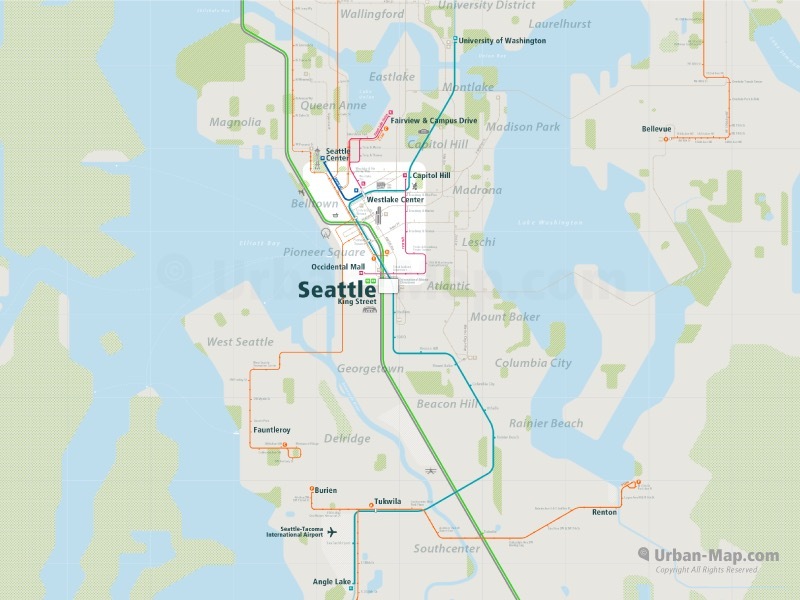 Seattle Rail Map - Available now as a poster! 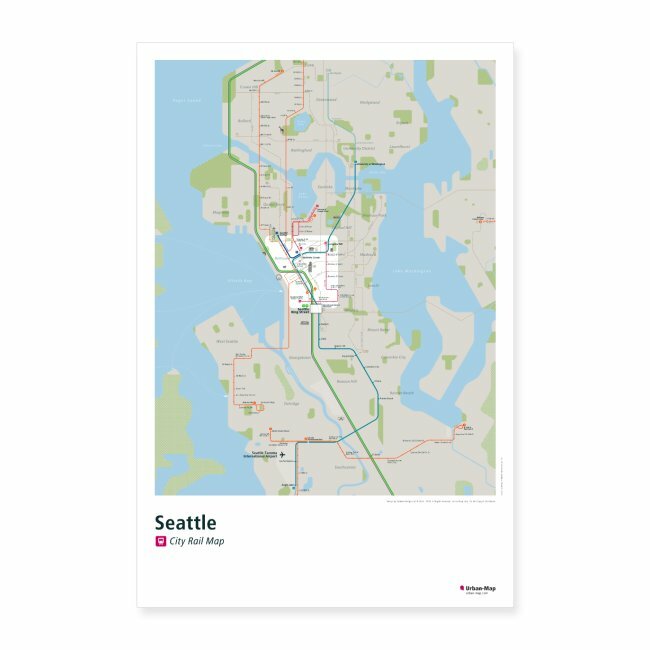 The poster of the Seattle Rail Map is available in the Urban-Map online print shop worldwide. 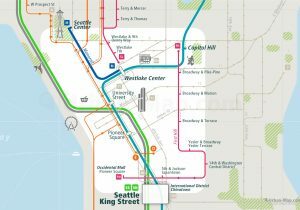 The Seattle Rail Map includes the public transportation system, as well as many major landmarks and points of interest. In addition to the maps, the City Rail Map app for mobile devices provides a route planner, the ability to search for all transport lines and station locations and connections, GPS support and many more features for your city trip. The handy › City Rail Map is therefore the ideal companion for traveling and getting around the city. includes Seattle and even more 60+ cities. Let the Seattle Rail Map show you the way where to go, where to stay and how to get there! Seattle, a metropolis consisting of nearly 4 million people with a dozen cities, is located in the Pacific Northwest between Puget Sound and Lake Washington in King County and is surrounded by Cascade mountains to the east and the Olympic mountains to the west. The weather is mostly warm in summer and cool and wet in winter. Your clothes should be warm in winter time. A rain jacket and waterproof shoes are advisable. The most common way to reach Seattle is by airplane. The Seattle-Tacoma International Airport is the main airport. From Sea-Tac Airport to Downtown by Sound Transit’s Link Light Rail the travel time is about 40 minutes. Seattle is well connected to » Los Angels, » San Francisco, » Vancouver, » Chicago, » Seoul and » London. In Seattle it is not recommended to use a car. With the trains of Central Link, monorail, streetcar and bus you easily reach most travel destinations within the city. Pioneer Square and Westlake Center are the hubs where the trains, monorail, streetcar and bus connect, from early morning to midnight. The RapidRide, a bus rapid transit and the trains of North and South Line provide a comfortable and fast public transport system to the cities of Tacoma, Bellevue and Everett around Seattle. For bicycling there are extensive trails and lanes are available, but the city is hilly and the weather is often rainy. The best places to stay for business are Downtown. For vacation and family activities, near the Seattle Center will be a better choice. For hiking and outdoor activities, you will find a good places near the mountains or parks. Nice coffee shops and small restaurants for eating and drinking you will find in Seattle in every neighborhood or city. A famous food for Seattle is smoked salmon, crab cakes and coffee. You will find many possibilities at Pike Place Market and Downtown. English is the common language. The people of the city call Seattle “Rain City, Jet City or The Emerald City”. Below you can get a glimpse of the Seattle Rail Map. The full version of the map, including all main transportation routes and lines on rail and partly also bus and ferry. Special clearly marked stations, transfer hubs and interchanges for line transfer, as well as station names and landmarks represented. The Seattle Rail Map can be loaded in the › City Rail Map app.